The Japanese barberry or berberis thunbergii is a deciduous hedging plant suitable for low formal or informal hedges. The berberis genus is one of the largest and most diverse worldwide, as about 450 to 500 different evergreen and deciduous berberis species have been discovered thus far. The Japanese barberry is a deciduous species most popular for its beautiful autumnal colours and its thorny branches. It is most often used as a standalone garden shrub, but it is also commonly used for hedging purposes. Berberis thunbergii can be quite ornamental, as it bears yellow flowers in the spring that are followed, in the autumn, by scarlet berries, that make a good food source for birds during the colder months of the year. The Japanese barberry possesses a number of attractive qualities that set it apart from its evergreen family. Evergreen barberries are a common sight in parks and gardens and remain green throughout the year. The deciduous berberis thunbergii, however, tend to add a lot more interest to your garden than evergreen shrubs, because of their small, appealingly-scented, pale-yellow flowers and most of all because of their foliage. While the Japanese barberry sheds most or all of its leaves by the time the temperatures drop, the most popular varieties have elegant red to purple foliage throughout most of the year, which is a display of colours that its evergreen relatives simply cannot offer. This is the plant to go for if you desire an elegant, attractive border to provide a backdrop for flowers or ground covering shrubs. 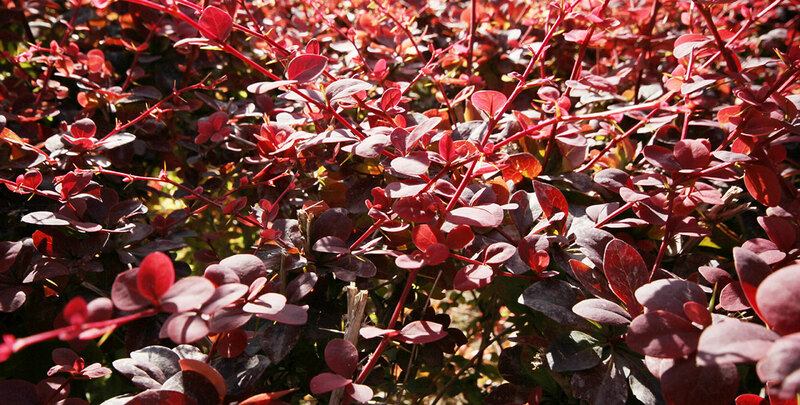 Why Choose a Japanese Barberry Hedge? As its English name already explains, the Japanese barberry is native to Japan and some other East Asian countries. Its botanical name refers to the renowned Swedish naturalist Carl Peter Thunberg, who first brought the species to European soil in the late eighteenth century. 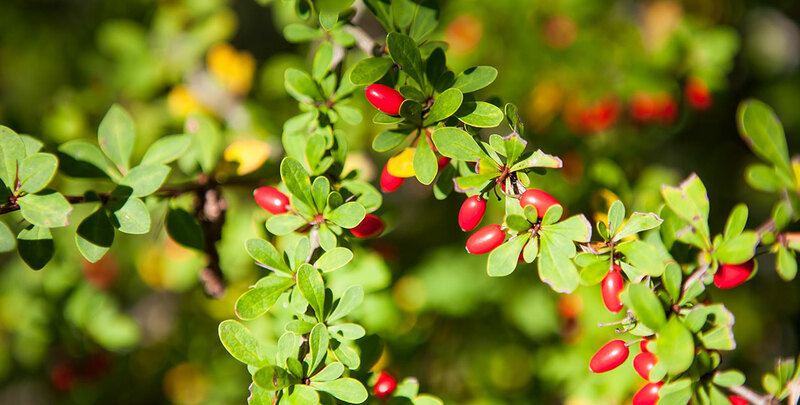 Therefore, the plant is also sometimes referred to as Thunberg’s barberry in English. These days, Japanese barberries have become widely naturalised in China and even in North America, where it is even recognised as an invasive species. This is why it is prohibited to sell them in parts of the United States. It is still widely grown as an ornamental plant, however, and many cultivars have been established accordingly. Some of these cultivars, like the berberis thunbergii ‘atropurpurea’ make excellent hedge plants. In addition, the Japanese barberry is of tremendous value for wildlife. Its stems are equipped with vicious thorns, which provide protection for nesting birds. These thorns can also be used to deter unwanted visitors, of course. For example, this species is often planted under vulnerable windows, where burglars might otherwise try to sneak in. This may even make a Japanese barberry hedge a good choice for a countryside hedge, as its thorns will not just keep human intruders away, grazing animals will also be discouraged by the spiny nature of this hedge plant. The glossy, bright red to orange-red berries mature during late summer and are technically edible, but often considered too bitter to actually be enjoyed by humans. Japanese barberry is a very easy-going plant, that will adapt to almost any soil type in a position with full sun to semi-shade. Since the Japanese barberry can be an invasive plant which spreads by seeding, it may be necessary to remove some unwanted plants every now and then though. Minimal annual pruning is required for an informal Japanese barberry hedge, while more formal hedges will require more attention. However, thanks to its slow growth rate of approximately 10 to 25 centimetres per year, pruning and trimming will not take up too much of your time either way. Pruning a barberry can be a painful experience though, so make sure to wear thornproof gloves and other protective clothing if necessary. Luckily, the Japanese barberry handles clipping well and does not require any special trimming technique, which makes it low maintenance. 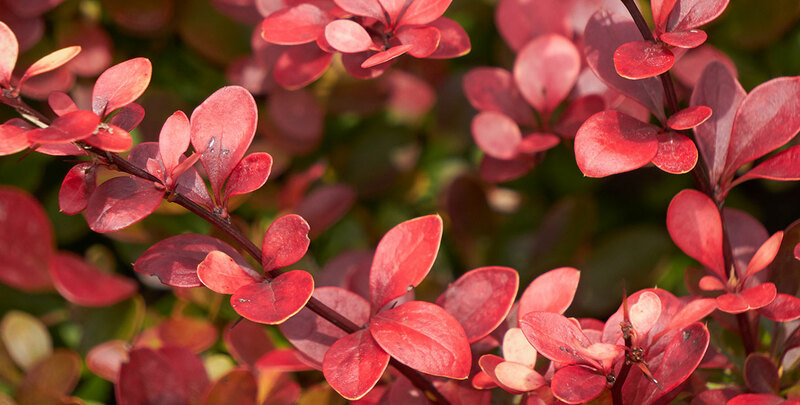 Due to its slow growth rate and relatively low and compact growth habit, berberis thunbergii is best suited to low border hedges, although with the right amount of care and patience, Japanese barberry hedges can grow up to 2 or 3 metres tall. Tall barbary hedges are something rarity though, as there are faster growing species that are generally better suited for this task. It is therefore unlikely that a Japanese barberry hedge will be able to guarantee your privacy, but the species certainly can be used for more than ornamental purposes, as it is not without its protective value. 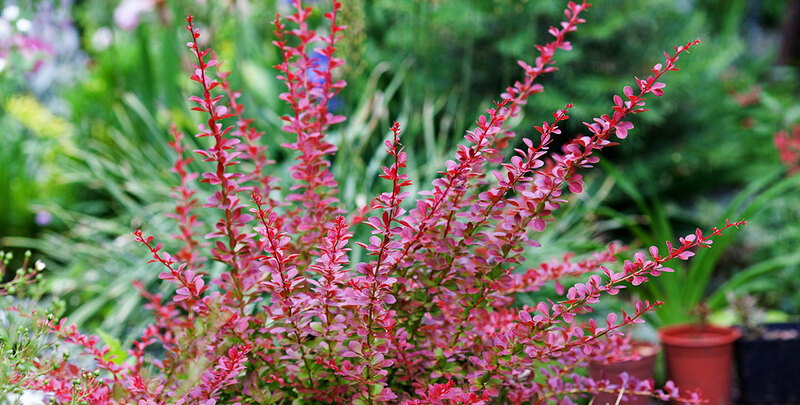 While it is understandable that people would prefer an evergreen hedge plant, the Japanese barberry offers a unique display of colours throughout the year. It has a different look for every season and will certainly discourage intruders from entering your garden. That does not mean that your garden will not be lively with a Japanese barberry hedge, as birds like to use the hedge as a nesting site, hiding from hungry animals between the thorns. You can see the change of the seasons reflected in the beautiful, elegant colours of your Japanese barberry hedge, which despite its thorns is relatively easy to maintain. Purple Japanese barberry is also a nice alternative for even more colour. Since Japanese barberries generally do not grow very tall, this species is often used to grow a low border hedge rather than to protect the privacy of its owner. Though it is not impossible for a Japanese barberry to grow tall enough to make a privacy hedge out of the species, we would recommend using a species that is more suited to this task. The elegance of the Japanese barberry is unrivalled, however, making this species a welcome addition to any garden.